Hello there and thank you for stopping by today. Today is the very first day of the MFT April Release Countdown. Only 5 days left until the new release (yay)! Be sure to head over to the MFT Blog for full set and die reveals for the day. This release is packed full of fresh and fun new products. 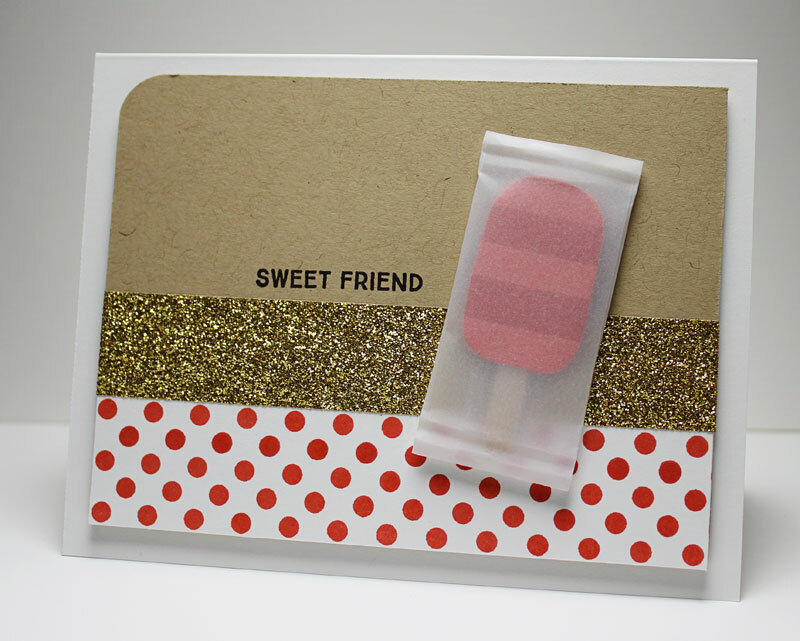 My cards today feature the new You're the Sweetest stamp set and Sweet Treats Die-namics. Both products are so COOL (get it?). Up first is this creation that came to me while I was in the shower. I was trying to think of a fun way to use the popsicle and BAM - popsicle in a vellum wrapper. I literally went through the steps in my head as I rinsed out my shampoo and shaved my legs. LOL Create packaging, insert layered, dimensional popsicle, use real wood stick, crimp ends. It's amazing that is how it went. I stamped the stripes from the set on the popsicle. Along the bottom of the card I stamped Darling Dots in Persimmon using my MISTI (check out that crisp coverage (loooooove it). I added a strip of gold washi tape, stamped the sentiment, and DONE. 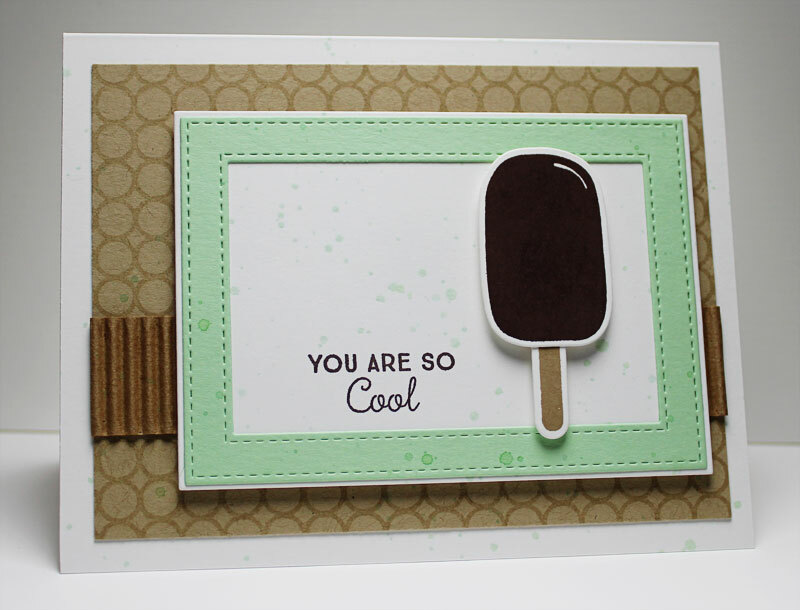 Up next is this "cool as a cucumber" card featuring a fudgesicle. 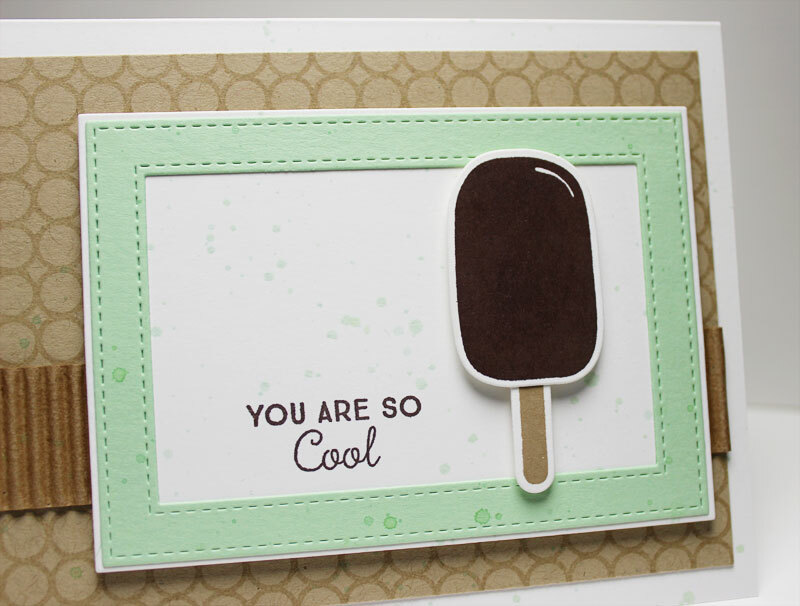 :) I stamped Chocolate brown ink on the coordinating die cut and repeated the process for the popsicle stick with Kraft ink. The sentiment was stamped on the white panel, which was framed with a Spearmint Stitched Rectangle Frame. In the background I stamped the Simply Circles in Versamark and layered a piece of corrugated paper over it. Finally, I mixed some Spearmint reinker with water and splashed some across the card. There must be mint ice cream under that chocolate coating. These products and many more will be available for purchase in just FIVE days, on April 7 at 10 PM EST. Be sure to check out the MFT Blog to see what the rest of the team has come up with today. Great designs. Love the vellum wrapper. Vellum wrapper did it for me. Your vellum wrapper is just pure genius! Awesome release! And such super awesome cards! Oh my, the popsicle wrapper is great! Cute cards. Jody, both of your cards are adorable. I really love the mint border die you used on your second card. I love how you made the pink popsicle still in the wrapper. LOL SO CUTE! Fantastic! Love that vellum wrapper! Cute idea, using a wrapper, very original!! LOVE them both...cool wrapper idea! So clever all packages and ready to go! Beautiful cards. I love that wrapper idea, it really sets it off. Great. Awesome cards! 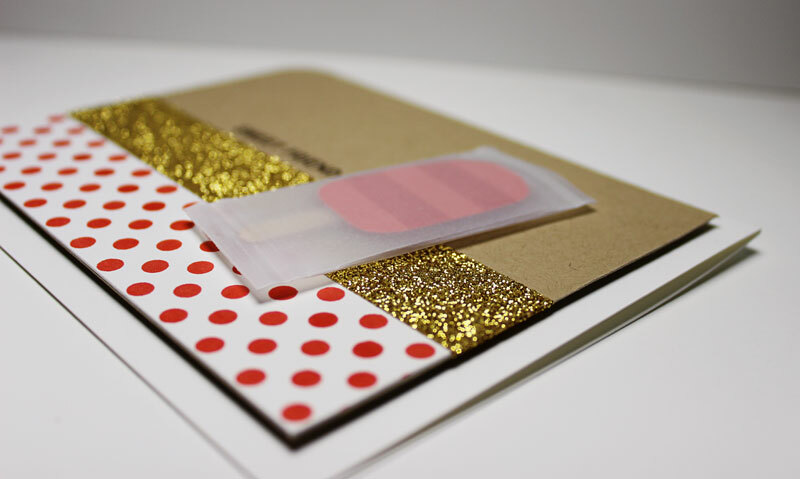 Love the vellum wrapper & that fudge bar is fabulous!! So neat how you even have the popsicle in a wrapper!! Great job, Love the vellum wrapper and that fudge bar. TFS. Such great ideas Jody. I'm always impressed with your creations. fantastic idea for this card!